14/03/2013: 7 babies, day 23 of the gestation period. 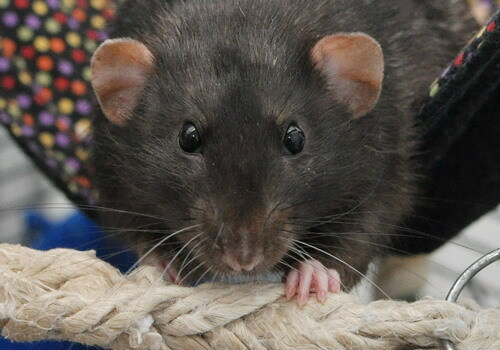 Flow is beautiful agouti doe who had her first litter in October 2012. Not only was she a fantastic, attentive mother, but she also came back into wonderful condition very quickly and overall is an outstanding doe. Because of this, and as her first litter turned out really nicely, we decided to mate her again, this time to a tabi buck from a different strain of the line. Merlin is a black dumbo buck (owned by Mary Bunce); he's a solid, sweet and friendly individual and we're hoping that the babies will have good type and lovely, affectionate temperament. We expected agouti babies, with a chance of black, and who may carry mink and/or Russian. Happily, we had a surprise gene pop up in this litter in the form of mink - we were aware that Flow carried it from Dandelion, but it must also have been carried quietly on Merlin's side for several generations, most likely originating from the Rivendell agoutis. As this litter will be born at Sundrop Rats, I'm only including brief information here - for more photos and further info, please visit their litter page at Sundrop!